Secretary of State, Lord Birkenhead appointed a 7 member all white Indian Statutory Commission or Simon Commission to decide on the readiness of India for constitutional reforms and on what lines. b) It also gave opportunity to young leaders with Socialist leanings like Jawaharlal Nehru and Subash Chandra Bose to come to the forefront. They demanded not just constitutional reforms but also socio economic reforms on socialist lines. c) Appointment of the Commission came along with the challenge thrown by Lord Birkenhead who doubted the ability of Indians to formulate a constitution by consensus. 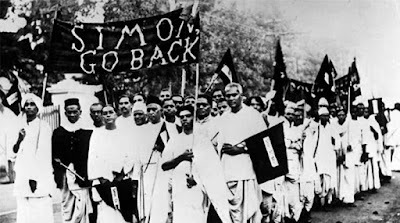 This led to an All Party Meet which formed a committee under Motilal Nehru to decide the constitutional framework of India. The prospect for Indian unity therefore seemed bright at the time. d) The report of Nehru Commission led to two major conflicts. Thus the appointment of Simon Commission played a pivotal role in India’s Independence Struggle.